With no shortage of on-demand services now available to people around the world, the ‘Uber for x’ approach to home services is certainly a well worn path. So why care about another new entrant in the market that’s taking the marketplace approach for service providers and customers? 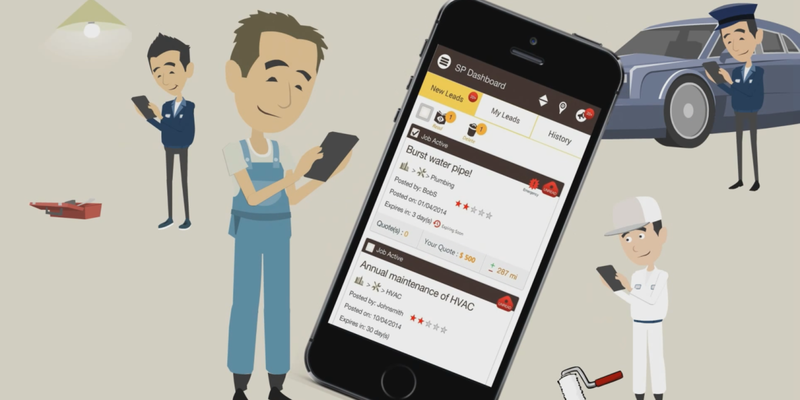 Because it’s not just aimed at your home – FixApp wants to be your marketplace for a whole range of things, from industrial tasks, to automotive, to painting your spare room. For now, FixApp is only available to users (and service providers) in the US, but with so many competitors (and most platforms now moving away from the marketplace approach in favor of a simplified on-demand offering) how does FixApp see the future playing out? FixApp is connecting people directly to their local service providers in real time. Customers post a job on the app, which is automatically sent to all registered service providers, allowing them to send quotes, create appointments and message each other for more information. How did the company come about? What’s your background? FixApp’s founders come from different backgrounds (IT and the industrial sector) – all family-men with full time jobs. We always had trouble finding reliable local services in a quick and easy manner. Via the usual methods, you mostly come across those with big marketing budgets, hardly anyone goes to page two of a search engine right? And if a service only sends you three estimates, who’s to say the fourth wouldn’t have been better? We wanted to level the playing field and support the small businesses who do not have a high budget to advertise or have the technical knowhow to have high rankings on search engines, but can deliver reliable services just like any of their competitors. So we created a simple app which allowed anyone providing a service to be able do so without looking at their bank balance. Who are your biggest rivals, and why are you different? We don’t like to think similar services as rivals. We launched FixApp because we saw something fundamentally erroneous in the market. There are certain services out there in a similar arena to us, but our business model, end goal and way of working is nothing like any other app out there. We feel we are different because we totally cut out the middleman and made the system automated, giving everyone a fair and equal chance to promote and chose. We are also aiming to eliminate fake reviews, need for advertising, gambling on leads, time-wasters amongst other current problems with existing services. With most other services favoring less responses for customers to check out, how do you plan on keeping both sides of this equation happy? Giving providers transparency – This means that providers can see how many others have responded to a job lead (not how much), this enables them to make a informed decision of whether the lead has already been saturated with responses or not. Our market research showed that providers would most likely not respond to a lead if it had more than 5-6 people already interested in it and were not happy with existing systems which made them buy a lead only to find out that they can’t do anything with it. The most they got was ‘credit’ for another lead. We have created a sort of ‘queue’ based system/interface so that you only physically see a set amount of responses, if you are not happy with what you see, you ‘load more’ . You can also easily show your disinterest in a response or even a lead, when that is done, the resting/queued response/quote is sent. We have limited the MAX to a safe amount and this coupled with the queue system, providers see a notification requesting their patience, as a quote is declined by the customer, the lead re-opens for estimates/responses. This is different from other services which end the search once 3 have accepted the cost of buying the lead etc. Get rich or change the world? Which would you rather, and why? We want to change the world of course but have bills to pay too! We want to help small businesses get on the map, get noticed. Given the financial situation of many, FixApp allows local businesses and individuals who have no knowledge about SEO or have advertising budgets, to have the same exposure as giant corporations who can afford billboards and a full-time marketing team. In our app, everyone is on the level playing field, we do not promote one service provider more than the other because they can spend more. Everyone who gets a job lead has equal chance of converting the lead into a job. And I think that also promotes good business ethics because once you realise you are no longer just your friendly neighbourhood provider and are competing against the big names, things might change. Our vision is to create the perfect marketplace for everyone to get any job done, the right way, and to revolutionize local service based on hard work, not hard cash, because that is how it should be. How big is your team? Tell us one weird fact about a member of your team. As the app process is automated and we don’t make sales calls, we currently do not have the need for a large team. Our team is a handful of aspiring, hardworking and committed full-time employees for customer support and marketing. We also have a super-talented technical team on standby to deal with any app issues and to regularly maintain/update it. We regularly update our users with improvements and new features, to provide them with the best experience they can get. Currently, we are working on an exciting big update to take FixApp to the next level. If you weren’t working on FixApp, what would you be doing? I am an innovator by nature and believe in simplifying things and finding solutions, not in a lazy way, but in a more efficient way. FixApp is the first realisation of a vision. It is a beginning for me, which I envision to branching out in several new undiscovered directions.